A couple of years after I got my first cat, Bernie, my then-boyfriend and I decided to get another cat. To put it mildly, Bernie wanted some company. He’d stand outside our bedroom door all night, meowing as loudly as he could because he was lonely. This is when we started to use earplugs. I browsed through our local shelter’s website and found an adorable kitty, about 18 months old or so, named Jake. The one thing that stood out, so to speak, was that Jake only had one eye. He was described as loving and cuddly, but when I called the shelter they told me no one wanted to adopt him because he was missing an eye. What??? 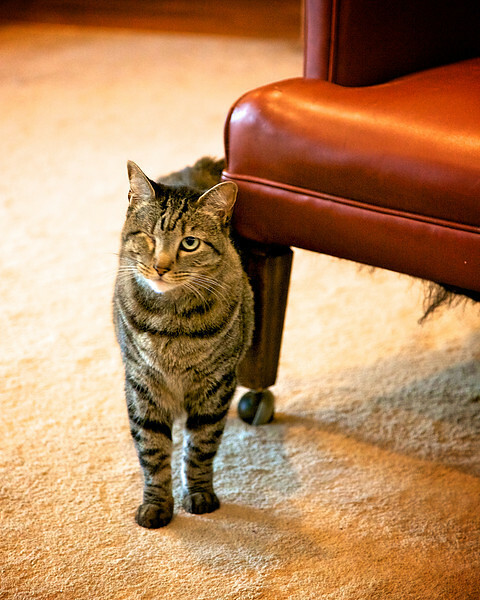 Honestly, I’d rather take a sweet kitty missing an eye than a two-eyed cat that is mean or aloof. He came home with us a couple of days later and has been the most loving and snuggly cat I have ever met. This is our new kitty the night he came home with us. We gave him a new name – Willie (point if you get the reference), or as I call him, Willie Boo. He rules the house, or rather, he rules Bernie, who is bigger but definitely not braver. He greets all our visitors with a quick sniff and then plops on the floor so he can be petted. Recently, we had some animal show in the background and they began talking about the Egyptian Mau – Mau being the Egyptian word for Cat. Turns out our little Willie-Boo here belongs to a race over 3,000 years old, celebrated in artwork and worshiped by pharaohs. Then we found out that our friends’ cat is also an Egyptian Mau, signaled by the extra flap of skin under their bellies, an M marking on their forehead and a bird-like vocalization. Willie has chirped for years without us knowing it was a clue to his prestigious lineage. On the downside, Willie is a licker with a sandpapery tongue, so if you come by, please don’t let him lick you for too long. 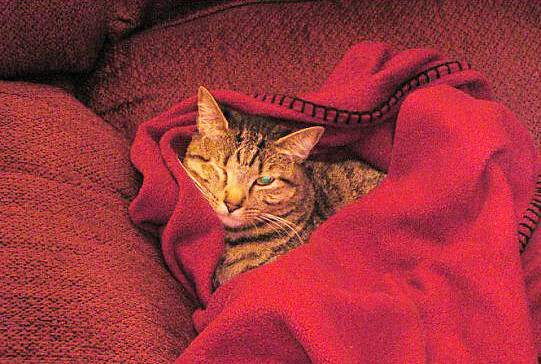 My husband took a nap while Willie was licking his arm and woke up to dots of blood where his skin had worn off – yikes! What a precious, sweet baby! I love feline royalty!! That is so interesting! 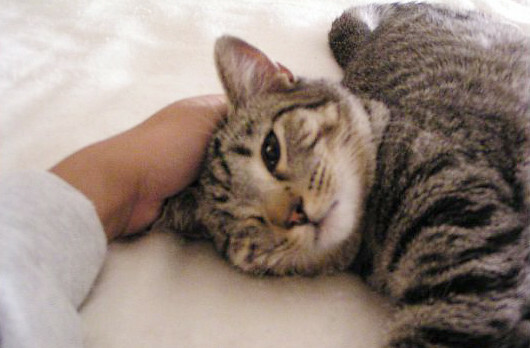 It is a loveable cat but having lost an eye can make kitty seem weird. Especially kids would see that right away. You didn't mention why it was missing an eye. Did they tell you when you adopted it? And is it now getting along with Bernie? Hopefully they are! have cell phones and 48% have data plans, providing a safe cyber-space should be a priority for all parents. on new origins from pop culture or video games and television. safe cyber-space should be a priority for all parents. Today, lots of websites and blogs bring in unheard of income for their owners merely by promoting another’s company on their web pages. for not going too far in either direction. of our loved ones. As the culture of internet slang grew, it took on new origins from pop culture or video games and television. Efficiency: Many carriers provide multiple receive emails, so your fax messages are automatically delivered to whomever you intend. The says of free proxies and tunnelling services are over, and as the Chinese government begins to tighten its grip on what comes in and out of the country informationally speaking, the need for a vpn to bypass internet censorship in China grows every day. promoting another’s company on their web pages. Although maximum site owners are familiar with these concepts, but they may lack the expertise to do it the correctly. out of the country informationally speaking, the need for a vpn to bypass internet censorship in China grows every day. By ranking your website on the very first page of search engine results, you are tapping into a huge number of people looking for what exactly you offer. a third-party server, and all your Internet traffic is routed through that server. some excellent traffic at a more reasonable price. By ranking your website on the very first page of search engine results, you are tapping into a huge number of people looking for what exactly you offer. aware of virus programming and started building viruses that manipulated and destroyed data on infected computers. run on the internet via a website. more reasonable price. To report stolen email addresses at Yahoo, click Yahoo. these concepts, but they may lack the expertise to do it the correctly. so that they can match well together.